This is slightly smaller ‘10' x 8'’ workshop (231 x 261 x 312cm). Still loads of room for a good ‘potting’ bench though. 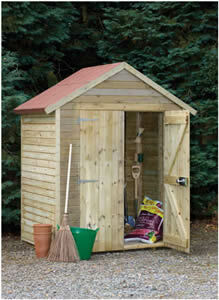 This is the ‘3.6m x 1.8m’ garden shed (237 x 200 x 365cm .) I can’t stand working in the dark – and you won’t in this really grand building. This is the 2.4m x 1.8m (237 x 200 x 245cm ) Still lovely and light inside, keep things tidy and there’s loads of room to work. Here is the 1.2m x 1.8m (237 x 200 x 125cm ). This is to stop you leaving your tools all over the garden – at least, that’s the cunning plan ! Join the loads of people, including my sister, who get so much satisfaction from keeping chickens, as well as collecting all those lovely fresh eggs. We have friends, in fact the folks who live on top of the hill ( no really ) who have rescued so many animals, as well as just buying a few! 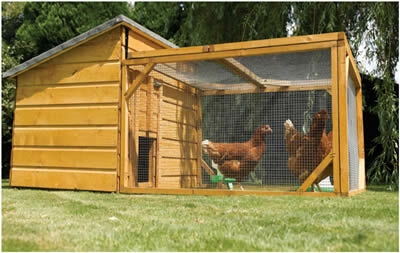 Horses, Donkeys, Rabbits, Chickens, Guinea Pigs all share their hill top, and the little ones live in houses like this. It’s light and easy to move even though the size is 54 x 100 x 244cm. 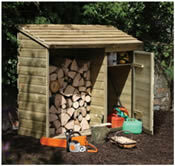 Every man needs a shed, says Joe. Well, I think every woman could do with one too ! Although perhaps for different reasons. Once, when house hunting, we were proudly shown a shed which had loads of bolts but they were all inside the door. 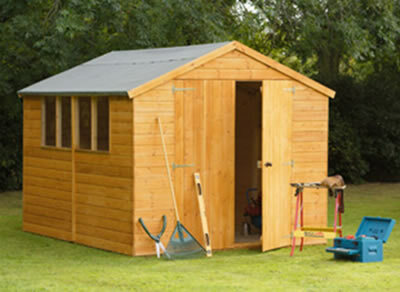 A really long established local firm make all our sheds and workshops. They have grown a lot since them, there days. 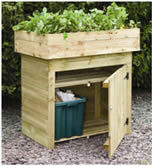 As well as garden sheds, and workshops they now make loads of other things too. Summer Houses, Pergolas, Arches, Planters all sorts of garden stuff. Oh sorry, I’m wandering a bit ! 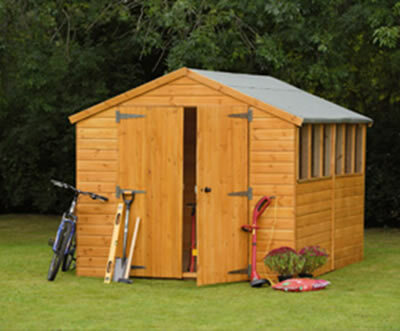 You want to know about good, sturdy no nonsense garden sheds. The timber in the walls of all our garden buildings is 12 mm thick ship lapped planed wood. That goes for the supported roof and floor too. 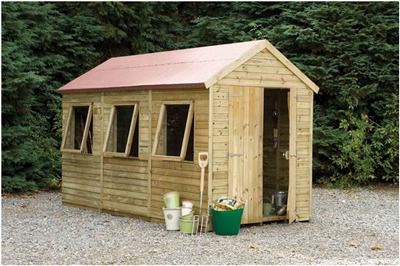 It’s all been pressure treated with an environmentally friendly friendly treatment which means we can guarantee your shed or workshop* for 10 years. 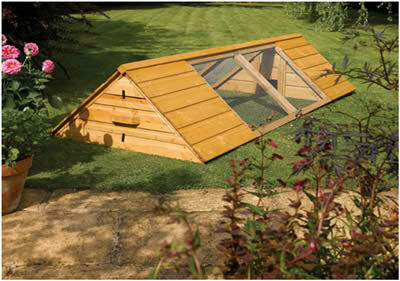 All of these garden buildings are fitted with stainless steel fittings and door handles. The roof is topped with red mineral roofing felt. 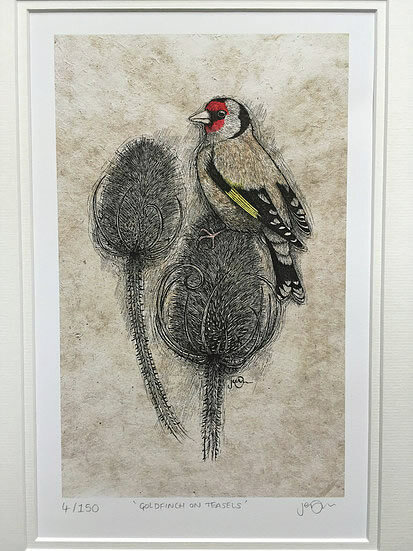 Which I really think looks lovely. No need to worry about balls, or long handles, crashing against the windows either, they are made of styrene – which is much more flexible than glass ! All our buildings come un-assembled, mainly because it would cost mega bucks to send them to you completed ! But don’t worry, you won’t need a Phd. in ‘flatpack assembly’ to erect them. The instructions are nice and straightforward. What you will need though, is a screwdriver, a hammer and, really, an extra pair of hands. With two, it is just so much simpler to manoeuvre the walls and roof panels. Oh, a spirit level would be a great help too. Because one thing that is absolutely essential ( unless you really want the neighbours to hear the wide range of your vocabulary ) is a firm, flat base. 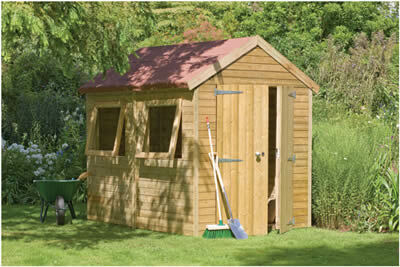 With these sturdy sheds though, that is not too difficult to manage. If you do not have an already levelled area, some strong treated joists, perhaps 10cm x 5cm, can be laid on some firm earth and simply hammered down until they firmly fixed and level. Lay them crossways ( for this shed for example they would need to be 2 m. long ) one at each end and then roughly 50 cm apart. This level base will make it so much easier to fix the windows and doors. The treated timbers of all of these buildings will, over the years, slowly and naturally change to a mellow, grey ‘driftwood’ colour. However, you can stain or paint them at any time. 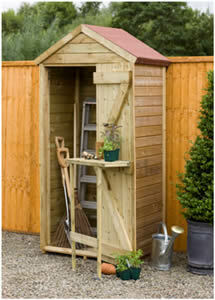 A nice, brightly coloured garden shed, which is in perhaps a dull spot in the garden, can really liven things up ! 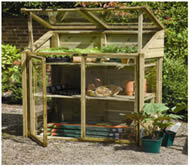 We can offer loads more than your ‘walk in’ garden buildings. 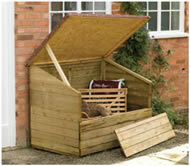 Below is just a few of the range, all crafted with years of experience, and all of course with FSC timber. All have been environmentally pressure treated, and are guaranteed to keep their looks for 15 years.